Driver shortages are only one of the roadblocks or disruptors affecting our industry. The ELD Mandate means the change-averse amongst us are in for wake-up call. Many believe the Electric Logging Device Mandate is a benefit to drivers, carrier and the public. The rule requires commercial truck drivers to record their hours of service electronically. Since its effective date in December 2017, the mandate has received mixed reviews. Organizations such as the Owner-Operator Independent Drivers Association (OOIDA) pushed for a two-year mandate delay. OOIDA’s coalition against the mandate includes industry trade groups representing agriculture, pyrotechnics, utility contractors and livestock groups which the Association says would be negatively impacted by the mandate. On the other side, organizations like ATA, the Truckload Carriers Association and the Trucking Alliance are in favor of the mandate. 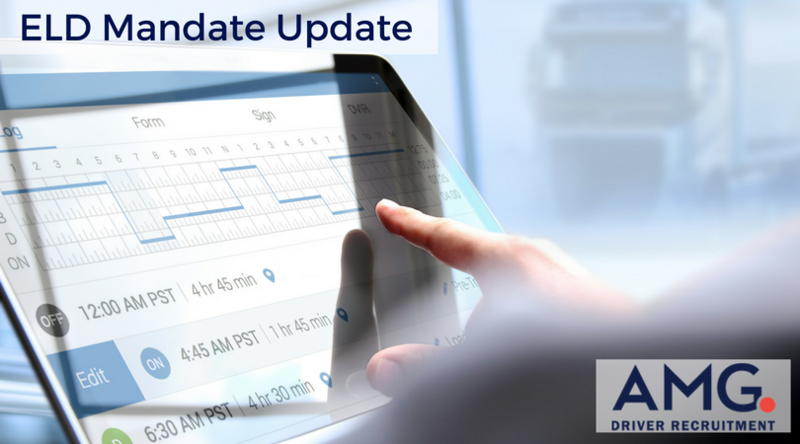 “We firmly believe that America’s truck drivers – if they were operating legally within the hours-of service rules before today – will see tremendous benefits in using an ELD. Whether in reduced crashes, less time spent on paperwork or in fewer errors in their logbooks,” ATA President and CEO Chris Spear said. Until April 1, commercial motor vehicle inspectors issued citations for any truck that isn’t ELD compliant. Inspectors started placing commercial motor drivers Out of Service (OOS) if their vehicle was not equipped with the required ELD on April 1.
keep a record of duty-status for no more than 8 days out of a 30-day period. Download the whitepaper 2018 Roadblocks: What’s Ahead for the Trucking Industry for more information.